In the interest of keep things exciting, we left the state park in Fruita in the middle of Labor Day weekend. 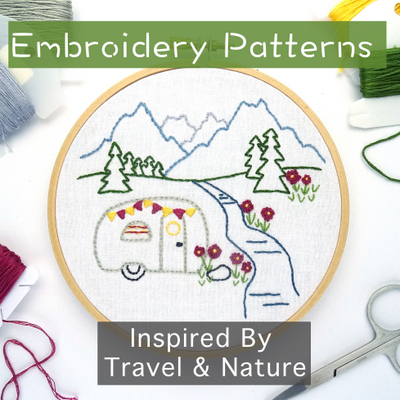 As anyone who travels in an RV, full or part-time, is well aware, showing up at a campground in the middle of Labor Day weekend is probably not going to yield good results. Which is why we didn’t plan to show up at campground. At least not until Monday. But we did want to be close by to our intended campground since it was a very small park that takes no reservations. Hence the need to leave Fruita on Sunday and find a close place to stay for the night. But I am getting way ahead of myself. First I have to tell you about the rodeo! On the way to Telluride we stopped in the tiny town of Ridgeway for lunch. Our intention was to simply find a spot to park the Airstream and eat a quick lunch before continuing on down the road. But on the way through town we spotted a sign for the Labor Day Rodeo. For some reason we’ve always wanted to attend a rodeo. Maybe because it seems like such a western thing to do. Or maybe we just like cowboys with tight jeans (Tim will probably disagree). 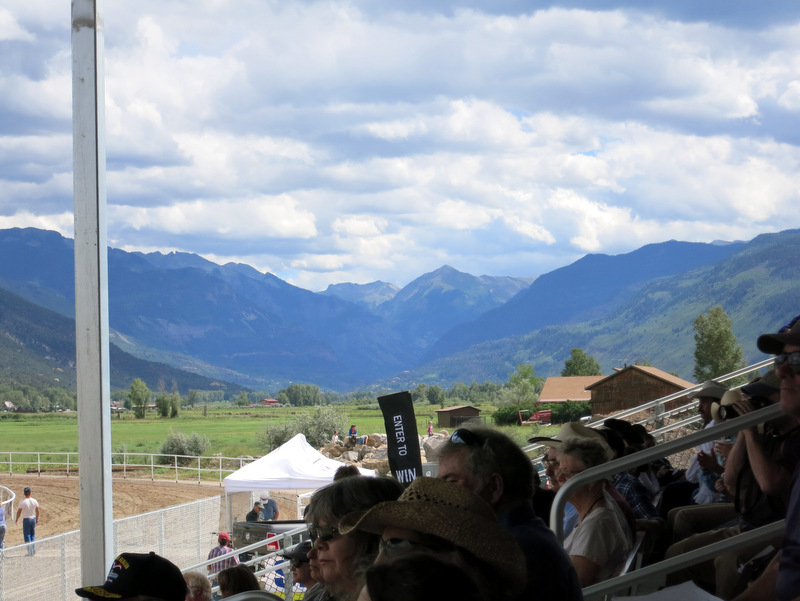 In any case, it seemed it was our lucky day as the rodeo was scheduled to start at one o’clock and was free to attend! We’re a sucker for free stuff, so we left the Airstream at the small park where we ate lunch, unloaded the bikes from the truck, and rode over to the fairgrounds. It wasn’t a big rodeo. There were probably only around 100 people in the grand stands when we arrived, and the events all had less than a dozen participants each. Truthfully, it was probably for the best because you can only watch so many cows get roped before it gets a tiny bit boring. We hung out for close to two hours and I was feeling ready to go when they announced that the final event of the day would be bull riding. Of course we had to stick around for that. It turned out to be a very short event, with only 5 or 6 riders, but it was great fun, and the crowd really got into it which made for a pretty exciting 15 minutes. After our two hour lunch/rodeo stop we continued down the road to Lizard Head Pass. 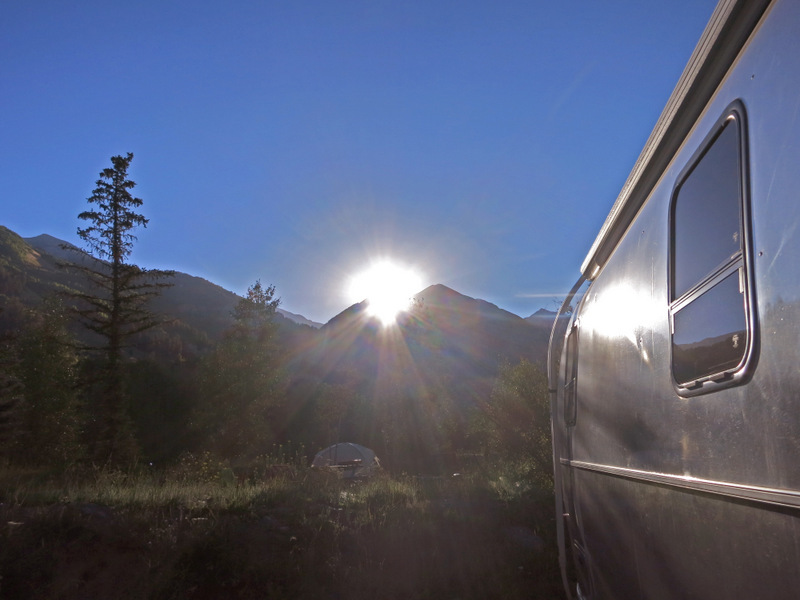 This high mountain pass just south of Telluride is a known boondocking spot with some spectacular views. It also has zero cell service which means we could only stay one night. We picked a spot right off the side of the road and somehow managed to get ourselves level without unhooking or using a giant stack of leveling blocks. There were probably close to 10 other RVs in the area, most with better spots and better views than us. If we were staying longer we would have scouted around for a site farther from the road with more privacy, but for one night it was all about convenience. It was absolutely gorgeous up there, but that one night made us realize how much we love to be connected. With no Internet, no t.v., and no radio stations we found ourselves at a loss as to how to occupy our time (go ahead and laugh, it’s okay). I ended up reading for a bit while Tim explored the neighborhood, and then after dinner we watched a truly terrible movie that I can’t remember the name of. It’s funny because while we prefer to stay in out of the way places, we like it best when those places have a great cell signal, at least a few over the air t.v. channels, and an NPR station. Just the basics, ya know? Some gorgeous spots up in the pass. Despite our aversion to this unplugged lifestyle, we successfully made it though the night and the next morning headed down the mountain to hopefully snag at spot at the Telluride Town Park. Check out was at 11:00 so we figured arriving around 10:00 was our best bet to get a site. With only 28 sites, and only a handful big enough to fit us, we were a little nervous about our chances. 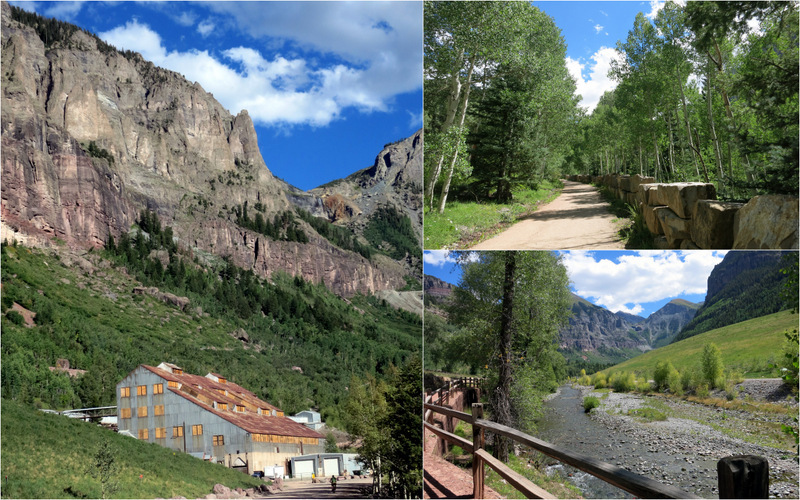 Also the Telluride Film fest was going on that weekend, with some events spilling over into Monday, so we knew the campground would be full from the night before. I guess as a consolation for spending the night without our precious Internet, the universe decided to reward us with some luck. First there were the three open parking spaces right in front of the park office. Since the park (and the town) offers no other parking for RVs this was some pretty amazing luck. Second, as we walked around the full campground glancing at the site posts that indicated over and over a leaving date of 9/2 (it was 9/1) we came upon one large pull-through site with a lone tent and a girl packing up her stuff. I asked it she was leaving and she said yes, as soon as her boyfriend got back from watching a movie (part of the festival) . Perfect! So we paid for the site, put our number on the pole and went back to our lucky parking spot to wait. And waited…and waited. They didn’t end up leaving until close to noon, despite the fact that check out was at 11, but we didn’t care too much because we were just relived to have gotten a site. 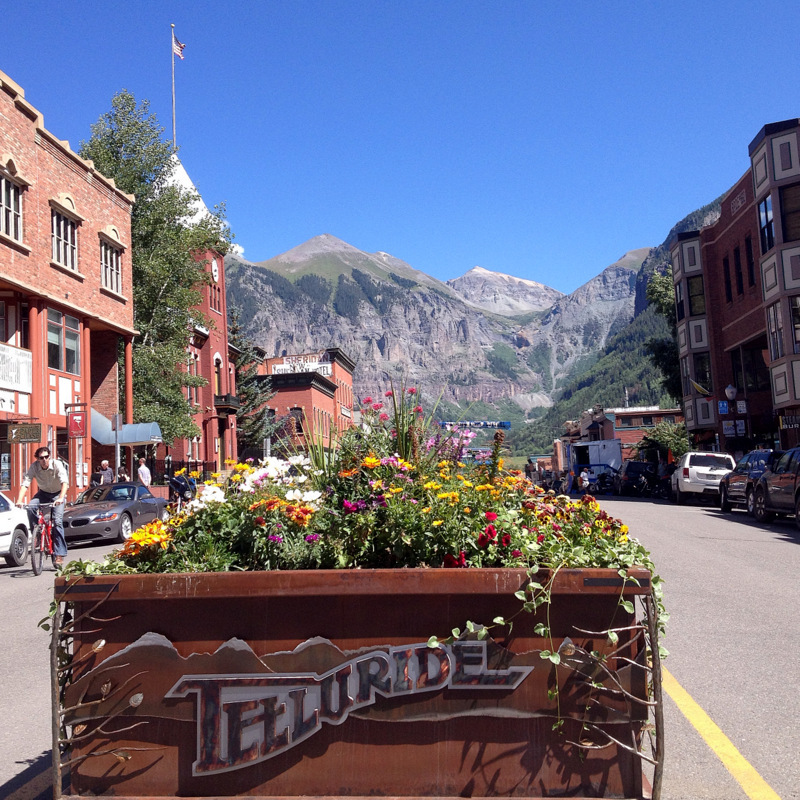 Telluride is NOT an RV friendly town. In fact, if you have a larger RV don’t even bother bringing it into town. Just don’t do it. You won’t find any parking, no good places to turn around, and no places to camp. Better to stay in Ridgeway and drive the 45 minutes to town for a day visit. That was our back up plan, but we really wanted to stay in town so I am glad it worked out. The town park is not cheap though. Which I guess should come as no surprise since nothing in this town is. But this goes down in history as the first time we’ve had to pay extra for our house. The camping fees here are $23/night and $7/night extra for a towed camper or car. So that’s $30/night for no hook-ups and the showers cost a ridiculous $3 for 5 minutes! What the what! I don’t mean to sound like a complainer…really I don’t, because the truth is that despite the expense we like it here. Our site has a great big back yard with views of the surrounding mountains, and we are right in town which means we have biked or walked everywhere this week. There is a wonderful bike path that runs alongside the river and through the park that we’ve taken full advantage of. The main section is a wide, gravel path, but as you get to the west of town it narrows to a single track that zig zags through areas of dense trees and across meadows with incredible views. Hard to stay on the path when the views are this good! If you head east from the campground the trail travels uphill along the river and through an Aspen grove. It ends at the old Pandora Mill and the trialhead for the Bridal Veil Falls hike (which we did last time we were in town). The other way to get around town without driving is on the free gondola. That right, I said free! Almost makes up for the $3 showers…almost. 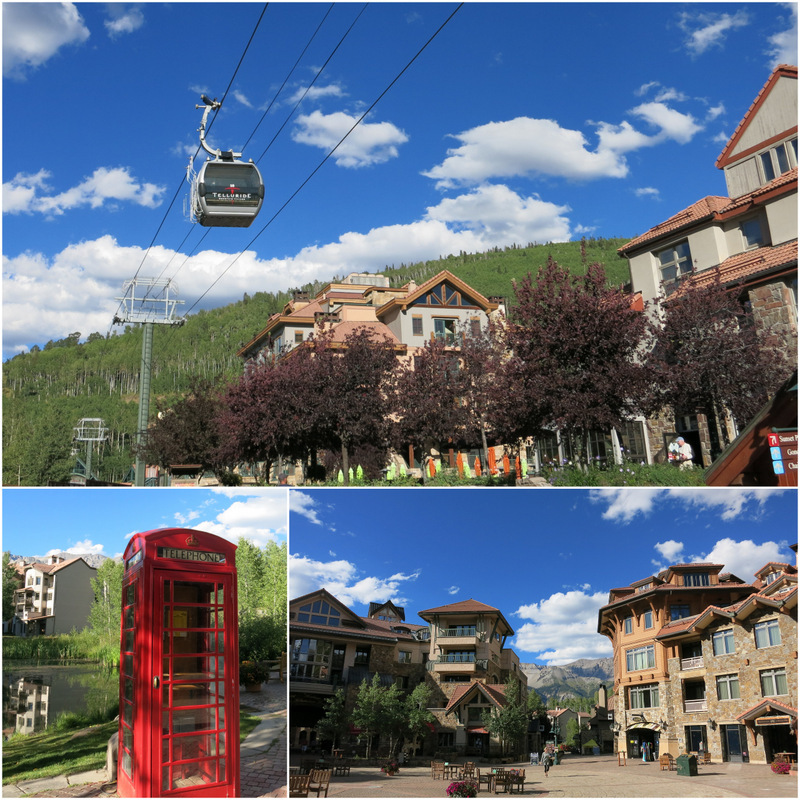 The gondola travels from downtown Telluride over to the Mountain Village with a stop at the top of the mountain. One evening we rode over to check out the village. It looks exactly like you would expect an expensive ski village to look like – lots of fancy condos, hotels, restaurants and shops. I didn’t get any pictures of the view during the gondola ride because there was a weird sun glare on the way up, and we were busy chatting with a local woman on the way down. Or rather she was busy chatting at us. In a span of less than 10 minutes we learned her opinion on the work ethic of people from the east vs. people from the west (apparently all you westerners are lazy), legalized pot (dirty hippies are ruining this perfect town), and shopping in a small town (she has to drive 3 hours Grand Junction). Phew…no wonder I forgot to take pictures. 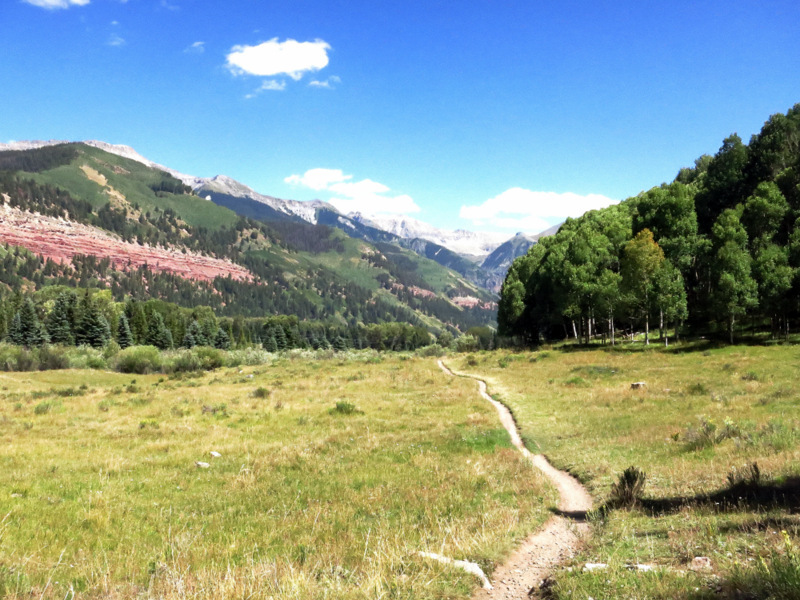 We’ve spent far more time this week walking and biking on the trails than we have exploring the streets and shops of downtown Telluride. In part because we already spent a good amount of time exploring Main St. during our one day visit back in June, but also because we just don’t have any urge to buy things. Oh, and we’re also on a hiatus from eating out right now. Last month we waaaay exceeded our (very loose) eating out budget and are determined to do better this month. I did go to the farmers market though. Because even if we’re not eating out, we still have to eat. For such a small town this was one of the nicer farmers markets I’ve been too. First of all, everything is organic. I usually don’t worry too much about the non-organic veggies at farmers markets because I know there are many small farms who can’t afford the organic certification, but are pesticide free. At least that’s what they tell me when I ask :) But is was nice to know that all those delicious peaches, squash and melons were completely organic. I bought as much as my two bags could hold including some of the first apples of the season. We’re still enjoying those famous Colorado peaches, but oh man, do I love apples! Apples, squash and beans…oh my! The weather has been perfect here this week with temperatures in the low 70s and lots of sun. We’re still in that pattern of rain in the afternoon, but not every day anymore which is nice. Hopefully the rain will hold off until late afternoon tomorrow because we have an epic hike planned at a very high altitude that will not be so fun in the rain. I’ll tell you about it on Monday. Happy weekend everyone! A FREE rodeo! What a lucky find. I too have always wanted to go to a rodeo but usually we just don’t feel like paying for something we’ll get tired of in short order!! I hear you on the camping with no signal of any kind…being connected is a fact, and necessity, of life these days IMO! Can’t wait to hear about your big hike…fingers crossed it doesn’t rain on your parade. I LOVE a good rodeo! 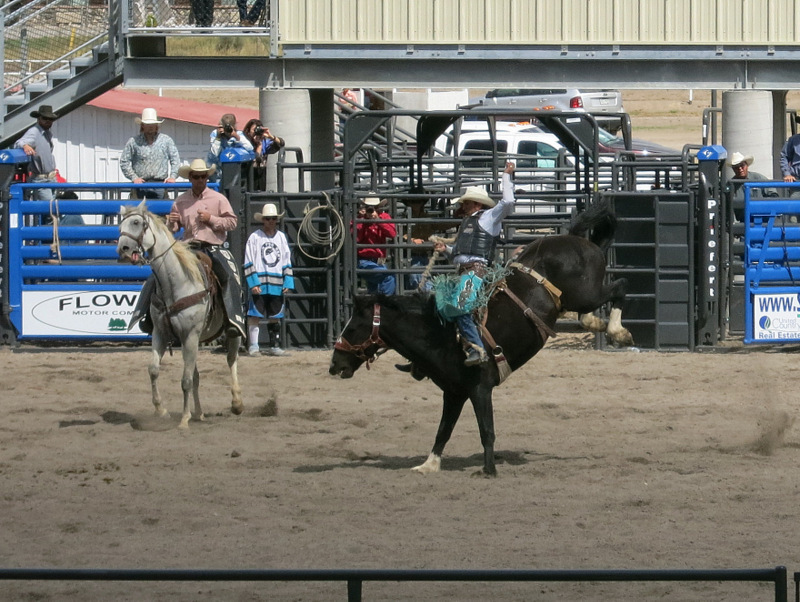 Did you get to see the mutton busting? It is hysterical. Nope, no mutton busting. In fact, I had to look it up to see what it was. Hilarious! Wish they had that event. 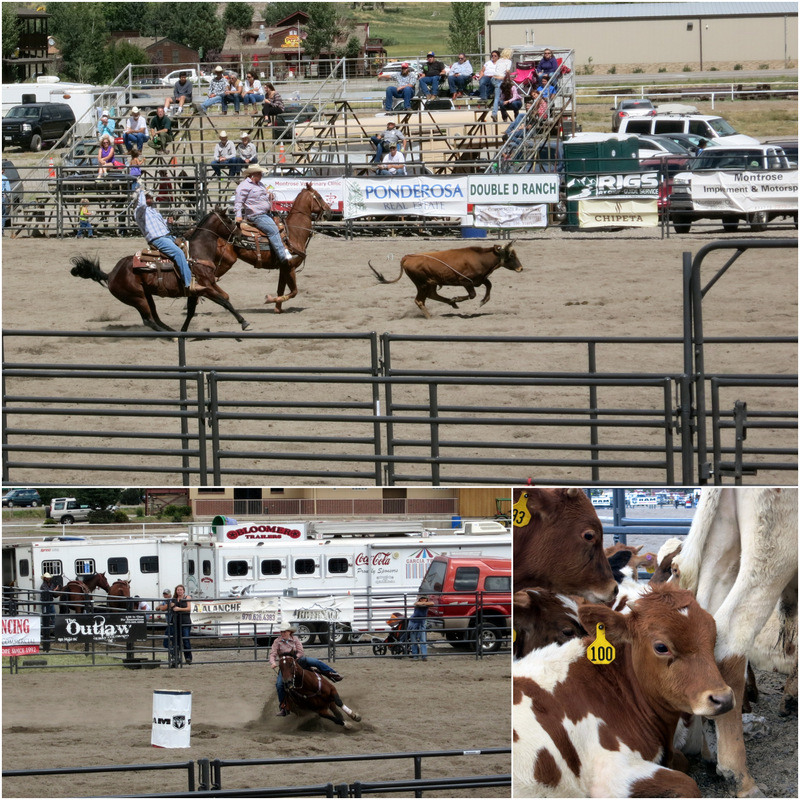 If you are ever near Los Alamos in early August – come see our County Fair and Rodeo. 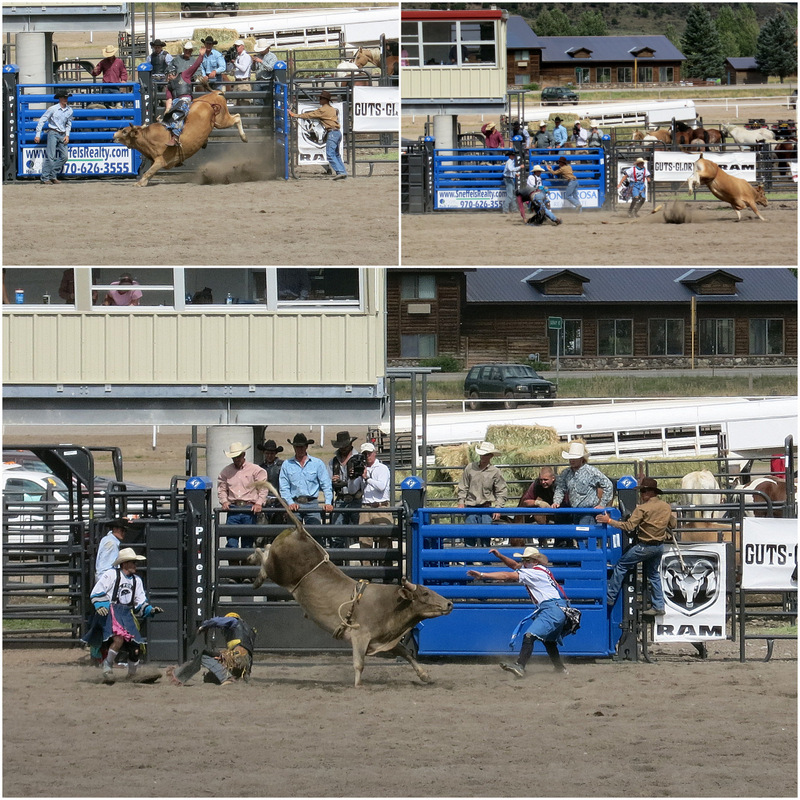 We have 2 days of rodeo including mutton busting. So fun! Before the bull riding starts, the kids chase a calf with a ribbon on its tail. OMG so fun to watch! I think September is the perfect time to visit. You would have no problem fitting in this campground. Just be sure to check the festival schedule ahead of time. Sometimes the festivals take over the CG and you can’t stay here without festival tickets. We haven’t done Telluride in an RV so thanks for the tips. We just arrived in St Vrain SP yesterday in Longmont and are waiting for some sunny weather. Gorgeous photos! Have fun in Longmont and I hope the sun shows up for you! 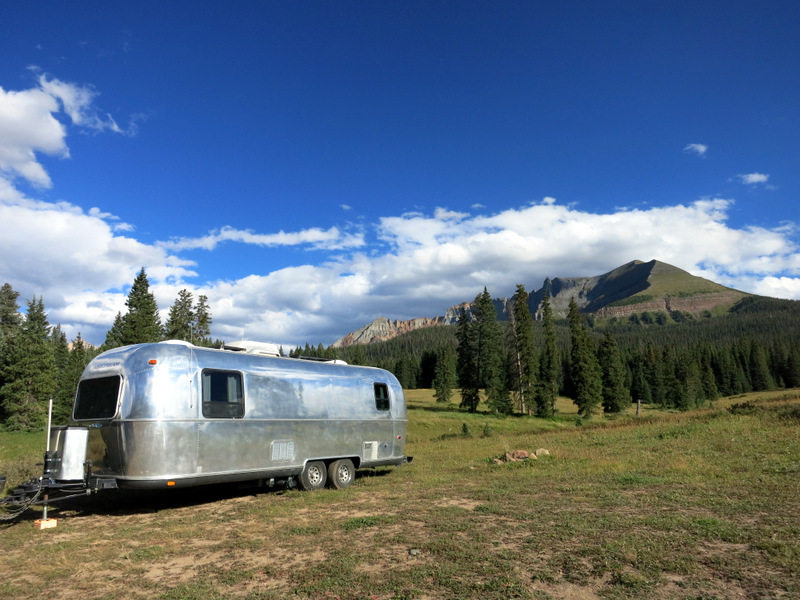 Great advice on RVing in Telluride. That’s why we park at Ridgway SP and do day trips to this beautiful mountain town. 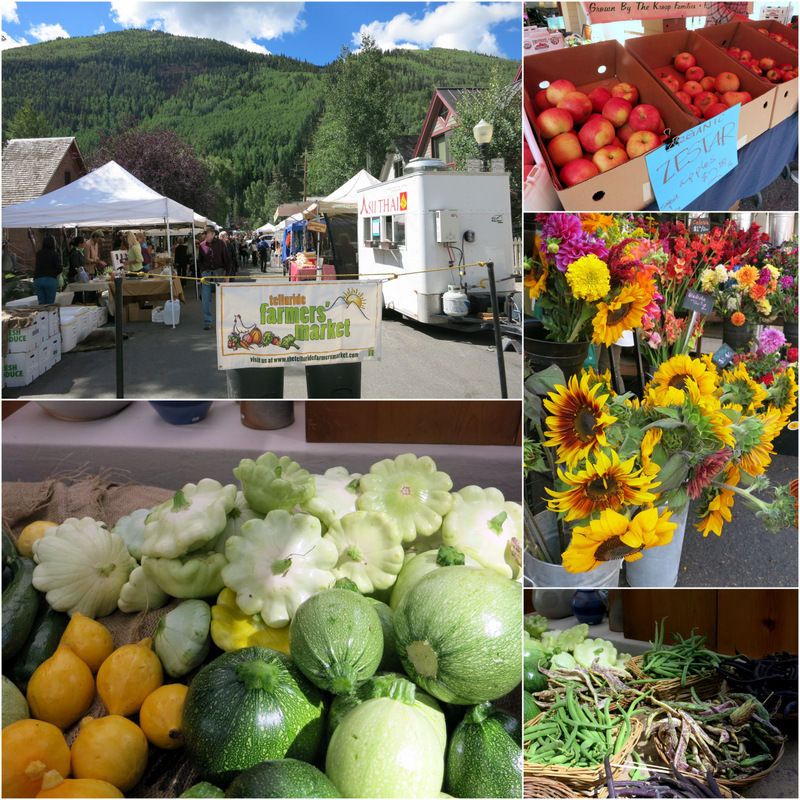 I agree, Telluride’s Farmer’s Market is a really nice one. We’ve always ridden the Gondola with a local and they are talkative, enlightening and occasionally entertaining. I’m looking forward to your next post on the hiking and wondered if you did that side of the mountain thing involving carabineer’s! Yup, I think Ridgeway is a great alternative to staying in town. We really wanted to be able to walk and bike everywhere all week though, so I am glad we got a spot. Didn’t do the hike with carabineers, although we did here about it. Sounds more scary than fun! 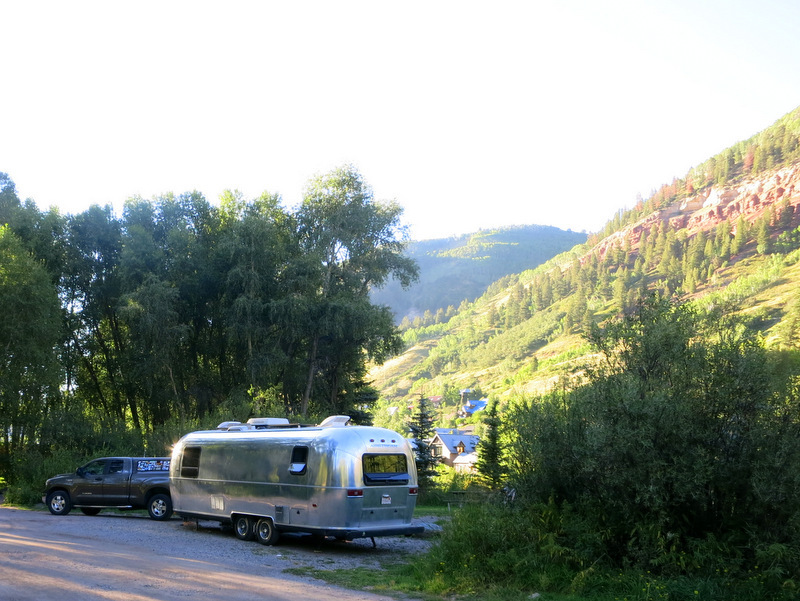 We stayed at Cayton Campground, about 20 miles from Telluride. No signal there, either. Would have liked to try the town park but didn’t want to chance it for the few sites we could fit in. It’s worth paying a little more for the convenience of being able to walk or bike to town, though. It seems like the entire surrounding area is void of a cell signal, which is why we are so happy that we got a spot here. It was pretty empty here in the middle of the week, so I think the key to getting a spot is to show up on a Tuesday or Wed. morning. And yes, it’s totally worth it to pay more for the convenience of begin right in town. We LOVED that area when we visited a few years back, but you are so right about the RV options. We were able to fit into Cayton (National Forest campground) just south of Lizard Head Wilderness which was just amazing, but absolutely NO signal as you mentioned (not even radio). None of the options near Telluride fit us. 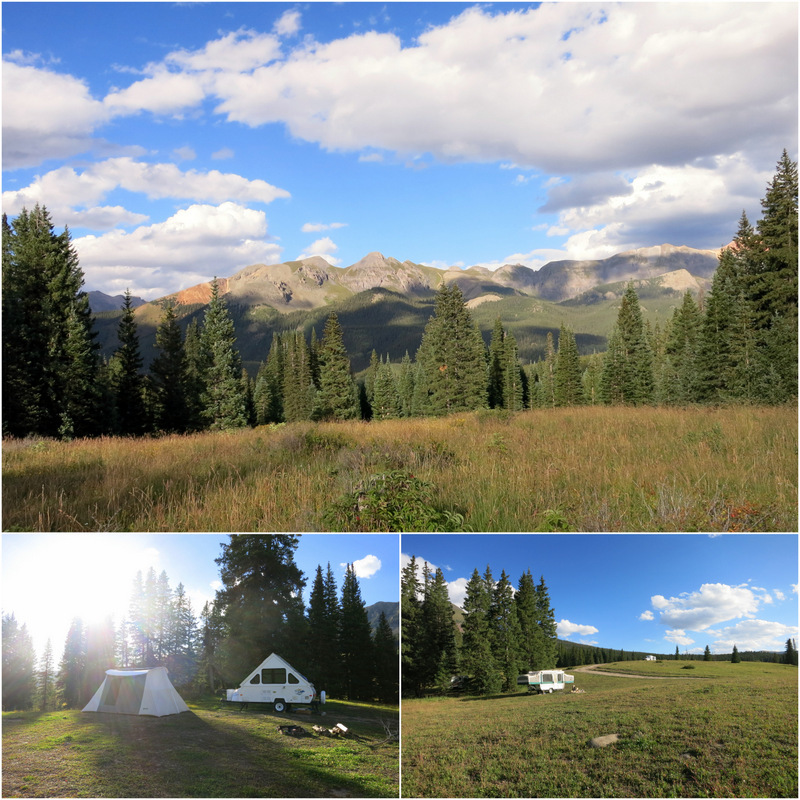 We spotted a few national forest campgrounds near Lizard Head Pass. Would have been perfect if there was a signal. Someone needs to open a real RV park in Telluride!